If you couldn't see the scoreboard, you could tell how much longer the game was by the length of Dr. Kenny's cigar. He always brought one for each half. A lifelong Peorian, Dr James N. Kenny, Sr. graduated from Spalding where he participated in football and boxing. He graduated from Notre Dame with a B.S. in Biological Services, and received his M.D. from St. Louis University in 1943. He served in the U.S. Army from 1944 until 1946, attaining the rank of Captain. 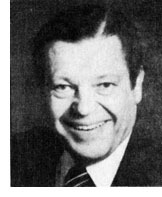 Completing his internship and residency in General Surgery in 1950, he practiced surgery in Peoria until 1990, and is a Fellow of the American College of Surgeons. A "fill-in" for Dr Cusack, he took over the Spalding Irish job in 1966 and served until 1986. He took care of injuries, supplied the team with Gatorade, and furnished player photos at the end of season Sports Banquet. Three sons played football for Spalding, and two daughters were cheerleaders. In 1976, Dr. Kenny received the University of Notre Dame Award of the Year for his commitment to family, his contributions to his community, and his desire to help and serve his fellow man. He was commended for the unselfish and charitable work that he performed throughout his career. Coach Tom Meyers (in back left), Left to right: Brian Opper, Curt Smith, Joe Harkness, Mitch Inskeep, Brian Miller, Jeff Kalteux, Todd Dewalt, Stan Johnson, Tracey Roberts, and Assistant Coach Greg Silzer. 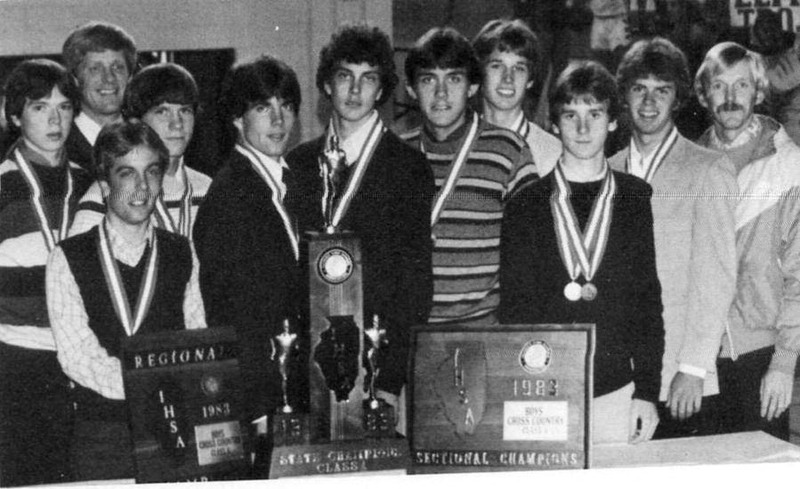 The 1983 Elmwood Cross Country team could be compared to the flight of the Phoenix. The ’83 team rose from the ashes of a 106 point drubbing from number on ranked Erie at the Amboy invite to capture the state championship four weeks later. Elmwood defeated second place Erie 62 to 147 by putting three runners in front of Erie’s number one runner and seven runners in front of Erie’s number three runner. Elmwood had four all-staters and the fastest team composite time (all seven runners) in class A history. The Elmwood runners were Sr. Mitch Inskeep, 5th in 15:09; Jr. Joe Harkness, 16th in 15:16; So. Stan Johnson, 20th in 15:22; Jr. Curt Smith, 24th in 15:27; Jr. Jeff Kalteux, 37th in 15:44; Sr. Brian Miller, 43rd in 15:47; and Jr. Brian Opper, 45th in 15:50.